The story is told by Cedric, played by Kevin Hart, who is very funny (stopping just short of obnoxious) as a man cherishing his newfound freedom while going through a divorce. If Chris Tucker’s fifteen minutes weren’t up, he would have been perfect in this role. Cedric introduces us to Dominic (Michael Ealy), a poor culinary school graduate who dreams of opening his own restaurant but in the meantime parks cars; Jeremy (Jerry Ferrara), a slacker who is more committed to a couch held together with duct tape and questionable stains than his longterm girlfriend; Michael (Terrence Jenkins), the mama’s boy; and Zeke (Romany Malco), a smooth-talking player who could charm the pants off a nun. Each man finds himself up against the perfect foil. Michael meets Laura (Taraji P. Henson), a Fortune 500 COO who won’t date anyone worth less than six figures, while valet parking the car of her dreams. Jeremy lives with motivated Kristen (Gabrielle Union) who wants him to grow up and put a damn ring on it. 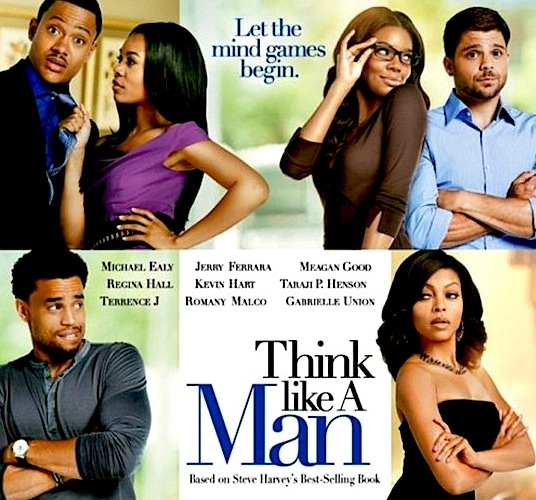 Michael gets serious with Candace (Regina Hall) who loves that he’s a solid father-figure for her son but doesn’t want to play second fiddle to mama. And Zeke faces 90 days of blue balls courtesy of Mya (Meagan Good) who refuses to give up her “cookie”. Ninety days is too long, y’all. The girls run across a dating book penned by Steve Harvey that teaches them how to manipulate their men. If you’ve ever read a dating book, you know this is a terrible idea. With the help of movie magic, the guys figure this out and turn the tables on the ladies. Hilarity, heartbreak, and happiness ensue, in that order. Steve Harvey is a funny guy, and his book provided some great comedy for this movie. The story and characters are relatable, the pace is steady, and parts are so hilarious that you couldn’t hear the next lines over all the laughing in the theater. Every girl has tried to manipulate a man using advice like that found in the book (Anyone have any success with that? Tell me your secrets! ), and every man has played games with a woman at one point or another. The characters were archetypes more than stereotypes, playing out a modern morality tale of love and its inherent mind games. Yes, we’ve seen this movie before, but focusing on the guys instead of the girls was a nice change. If I’m going to nitpick, the movie suffered from the same problem that affects a lot of ensemble comedies: with several different stories going on at once, none of them gets a chance to be fully developed. The group of guys had more chemistry than was seen in any of the relationships. Since we didn’t see the relationships grow much, the lies and deception didn’t pack as much of a punch as there might have been had the story focused on just one of the relationships. It all wrapped up (too) neatly without much work; it might have been more believable if everyone didn’t get a happy ending. Does any of this matter? Probably not. This is a fun, funny movie that is at the very least worth renting or watching on a plane. Get yourself a date and some popcorn, laugh a lot, and think about all the new ways you’ll learn to manipulate each other. Film Review: ‘Think Like A Man Too’!! This entry was posted on Friday, April 20th, 2012 at 11:46 am	and is filed under Film, News. You can follow any responses to this entry through the RSS 2.0 feed. You can skip to the end and leave a response. Pinging is currently not allowed. « Martin Scorsese and Leonardo DiCaprio Officially take on ‘The Wolf Of Wall Street’!!! Die you mummy bastards. Die. There is no call for bad language.